Mode: Popup menu, Default: Vignette . Selects between several variations on generating the Vignette shape. Vignette: The Vignette shape and location are defined by specific parameters. 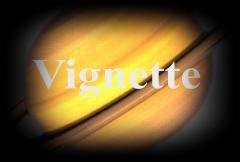 VignetteMocha: The Vignette shape and location are defined using a Mocha Mask. The center location of the vignette effect. Squareness: Default: 0, Range: 0 to 1. Determines how square the vignette shape is. Set to 1.0 for a square or rectangle shape. Set to 0 for a circle or ellipse. Values in between give rectangles with rounded corners by varying amounts. Radius: Default: 0.9, Range: 0 or greater. Distance from the center to apply the vignette. This parameter can be adjusted using the Radius Widget. Rel Height: Default: 0.75, Range: 0.05 or greater. The relative vertical size of the vignette shape. Increase for a taller shape, decrease for a wider one. Rel Width: Default: 1, Range: 0.05 or greater. The relative horizontal size of the vignette shape. Increase for a wider shape, decrease for a taller one. Rotation in degrees of the vignette shape. Note that rotation will have no effect if Squareness is zero, and Rel Width and Rel Height are equal. This parameter can be adjusted using the Rotate Widget. Edge Softness: Default: 1, Range: 0 or greater. Smooth Curve: Default: 0.4, Range: 0 to 1. If zero, a linear gradient is used across the screen in the soft edge area. Increase this value to use a smoother 'S' shaped curve for interpolation which can reduce the visual perception of the gradient's start and end locations. The color of the vignette. The opacity of the vignette; animate to 0 to fade the vignette out. Blurs the borders of the image in addition to darkening them. Blur Inside: Check-box, Default: off. If checked, the center (undarkened) area of the image is blurred instead of the border. Source Brightness: Default: 1, Range: 0 or greater. Scales the brightness of the source clip. To see only the vignette, set this to zero. Combine: Popup menu, Default: Composite . Determines how the vignette is combined with the Source. Composite: composites the vignette over the source clip. Mult: the vignette color is multiplied by the source clip. If the Color is not black, this will selectively colorize the vignette area. Add: the vignette color is added to the source clip. This will have no effect if the vignette color is black. Screen: the vignette color is combined with the source clip using a screen operation. This will have no effect if the vignette color is black. Subtract Inv: the inverse of the vignette color is subtracted from the source clip. Inverse means white for black, yellow for blue, and so on. This mode looks similar to Mult, but a bit more severe; it crushes the blacks and leaves the highlights more. This will have no effect if the vignette color is white. Vignette Only: shows the vignette pattern without the source clip. The output will be white where the amount of vignetting is greatest (e.g. where the source clip would be darkened completely). Vignette Only Inv: shows the inverted vignette pattern without the source clip. The output will be white where there is no vignetting (e.g. where the source clip would not be darkened at all).